Jim Kacian's Red Moon anthology of the year's best from Contemporary Haibun Online. 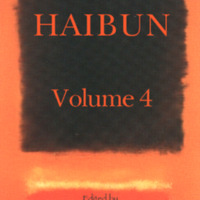 61 haibun and 28 haiga, with an introduction by the editors and an index of authors and artists. Kacian, Jim (editor in chief) , “Contemporary Haibun Volume 4,” The Haiku Foundation Digital Library, accessed April 18, 2019, https://www.thehaikufoundation.org/omeka/items/show/45.